In Pakistan, increased tax enforcement may be a more effective way to raise revenues than increased tax rates, given the large share of informal employment. This could in turn increase GDP due to increased government investment capacity. Like most developing countries, Pakistan has a comprehensive set of statutory taxes that firms are required to pay on a regular basis. Just about every good sold requires a sales tax to be collected at the time of sale. Some goods feature a separate excise tax as well. Hiring workers results in payroll tax liabilities, and purchasing other inputs, such as energy, means additional input taxes. At the end of the year, firms file a corporate income tax and their profits themselves are taxed. Regional governments also get their share, often in the form of business licenses or other fees. With all these tax laws on the books, one might expect that Pakistan brings in more than enough tax revenue per capita. The truth is, that by just about any metric, it doesn’t. In recent years, Pakistan collected just 10 percent of its gross domestic product (GDP) on average. This compares to 18 percent in India, 28 percent in China, and substantially higher percentages in the United States and Western European nations. In an absolute sense, Pakistan’s low revenues make it hard for them to invest in growth-enhancing infrastructure projects like road building and expanding the electricity grid. So why doesn’t Pakistan collect more revenues? At the heart of the answer is a lack of tax enforcement, resulting in very uneven tax collection across firms of different sizes. Recent estimates are that just 36 percent of manufacturing employment is in the formal sector. The remaining two thirds of Pakistani manufacturing workers are employed at (mostly small-scale) informal firms that pay few or no taxes each year. Figure 1: Estimated effective tax rates by decile of the formal manufacturing firm size. Even among formal manufacturers, tax enforcement is strongly related to firm size. We calculate that while the average formal manufacturing firm pays 8.8 percent of its value added in taxes (summing across all different types of taxes), the smallest formal firms pay around 3 percent, and the biggest pay more than 15 percent (See, Figure 1). How do entrepreneurs respond to such sharply higher effective tax rates for larger firms? Many of them try hard not to become larger firms! That is, many entrepreneurs avoid making investments that would raise their productivity and increase their employment. This is hardly the incentive the government of a developing country ought to be providing to its firms to stimulate growth. What should the government of Pakistan do instead? To answer this question, we build on a simple model of the Pakistani economy featuring heterogeneous firms that operate in either the formal or informal sector. Firms can make investments that raise their productivity and size, but this involves becoming formal as well. In other words, firms trade off the higher productivity of their investments with the higher tax rates they face. 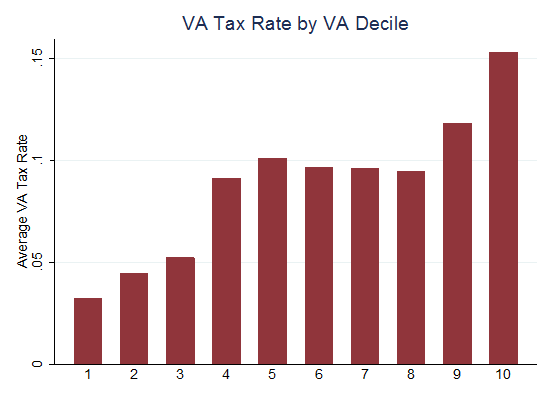 We use the model to simulate the effects of increases in tax enforcement. In our main exercise, we simulate a cost reduction of operating in the formal sector (relative to the informal sector) by 10 percent. We consider this a plausible outcome arising from a policy shift to substantially greater enforcement capacity in a developing country like Pakistan. Our simulations predict that GDP per capita would increase by 1.8 percent as production and employment shift out of the (less productive) informal sector (which declines by 3.3 percentage points). Greater enforcement also has two positive effects on tax revenues. First, the government of Pakistan now collects revenues from firms that have shifted to the formal sector. Second, those firms now operate at a larger scale and thus have higher revenues and profits as part of the tax base. Together, these forces increase tax revenues by 7.9 percent. These revenues could additionally raise productivity by allowing for growth-enhancing investments in infrastructure or other public investments. We emphasise that these additional growth effects are not in our study, nor are the costs of increasing the budget of the Federal Board of Revenue of Pakistan. Measuring these additional effects are beyond the scope of this analysis. As a frame of reference, we compare this policy change to an alternative that increases the tax rate by one percentage point. The higher tax rate increases revenues by 9.2 percent, comparable to our tax-enforcement scenario. However, increases in tax rates come at the expense of lower GDP growth. We calculate that this higher tax rate induces 1 percent of firms to shift from the formal to the informal sector, which lowers GDP per capita by 0.5 percent (due to the investments forgone by these firms). This compares with an increase of nearly two percent in our middle scenario above. The point of this exercise is to highlight how investments in tax enforcement capacity may be a more effective way to raise revenues than increases in tax rates, given the large share of informal employment in Pakistan. Both policies raise revenues, but greater enforcement has the positive side effects of lowering informality, increasing investment, and increasing GDP growth, while increases in tax rates have the exact opposite economic effects. We conclude that increases in tax enforcement capacity may have substantial growth impacts in the medium run. Increasing enforcement will induce some small firms to make productivity-increasing investments and join the modern sector. This will raise GDP per capita directly. Increasing enforcement will also raise revenues, which will likely indirectly increase GDP in the future due to infrastructure investment. We note that there is evidence that investments in tax collection capacity more than pay for themselves and in fact have an enormous return on investment (FBR Pakistan, Biannual Review 2015-16). Given this, there is a strong case that the government of Pakistan should further consider increasing tax enforcement capacity to increase growth.